with high blood flow detected. probable AV malformation inside the lesion. Hemangiomas are benign tumors of the endothelial cells which normally line the blood vessels. about 25% -- trunk, 15% arms or legs. Most (about 80%) hemangiomas grow as a single tumor, about 20% multiple areas. nSizes range from 2 mm to more than 20 cm. Several pharmacologic agents have been postulated to promote tumor growth. 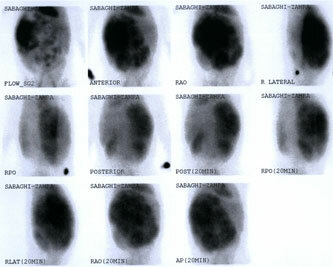 nmay be multiple in as many as 50% of patients (Mergo, 1998). prohibit their development . (Dodd, 1999). nSex: female-to-male ratio of 5:1 to 6:1.
: can occur in individuals of any age. 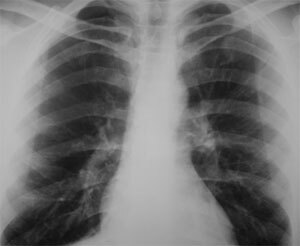 frequently occur in middle-aged women. 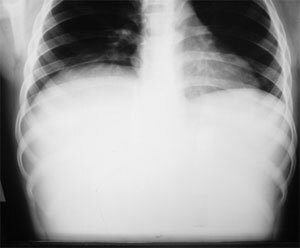 an arterial bruit over the right upper quadrant. nAnemia and reduced hematocrit levels in patients with ruptured hemangiomas. nThrombocytopenia -- from sequestration and destruction of platelets in large lesions. nHypofibrinogenemia has been attributed to intratumoral fibrinolysis. nIn patients with giant hemangiomas associated with Kasabach-Merritt syndrome, bleeding and clotting parameters may be abnormal. 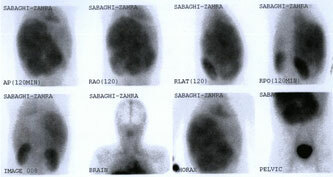 nNormal alpha-fetoprotein and carcinogenic embryonic antigen (CEA) levels. nDepend on the size / location of tumor. nPressure on the stomach and duodenum may cause vague abdominal pain, early satiety, nausea, and vomiting. (Tran-Minh, 1991). abdominal pain, abnormal liver function. greater than 14 yo without trauma. Hepatic hemangiomas plus congenital hemiatrophy and nevus flammeus, with / without hemimeganencephaly. Giant hepatic hemangiomas, thrombocytopenia & intravascular coagulation. Numerous small hemangiomas of face, nares, lips, tongue, oral mucosa, GIT, and liver. Cerebellar & retinal angiomas, with lesions in the liver and pancreas. 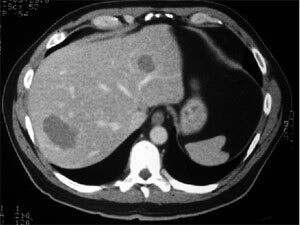 Multiple hepatic hemangiomas reported in SLE. 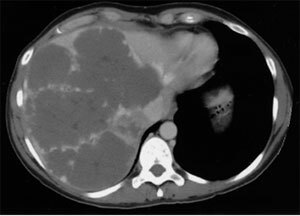 Other hypervascular benign and malignant space-occupying liver lesions. cysts, adenomas, focal nodular hyperplasia, and regenerating nodules. hepatocellular carcinoma and metastasis hemangioendothelioma. Ultrasonography is a cost-effective imaging modality for diagnosis of a hemangioma. Most commonly initial diagnostic tool. 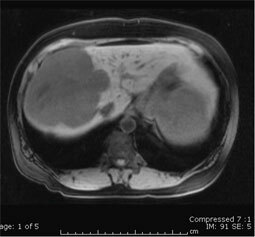 shows a hypointense mass within the right hepatic lobe. (SPECT) with colloid 99m-labeled RBCs. 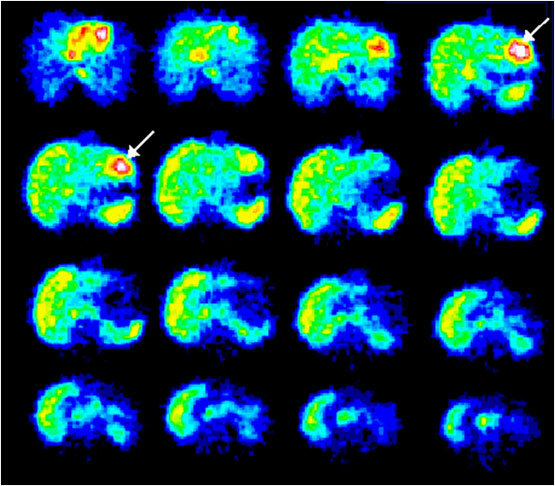 –SPECT with colloid 99m-labeled RBCs appears to be as sensitive and specific as MRI. 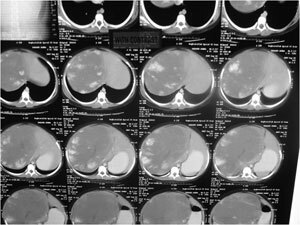 –At present, SPECT scan is most likely the investigation of choice to confirm the diagnosis of hepatic hemangioma. 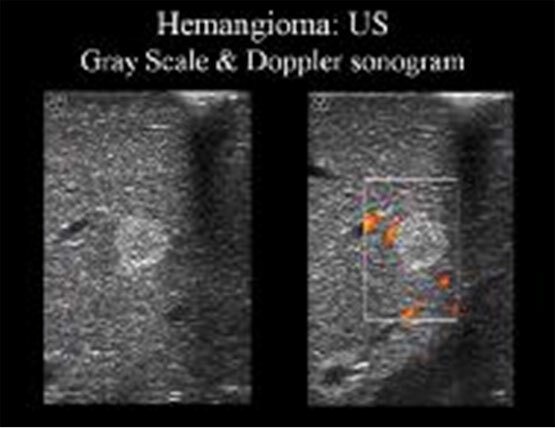 –Hemangiomas as small as 0.5 cm may be detected with SPECT. 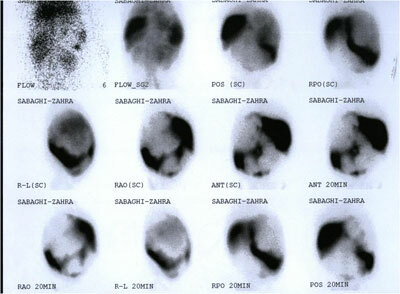 SPECT examination: Axial scans of blood-pool scintigraphy with 99mTc-labeled erythrocytes: A well-circumscribed area (arrow) of increased activity is present in the left lobe of the liver, which indicates pathology with a high blood content. 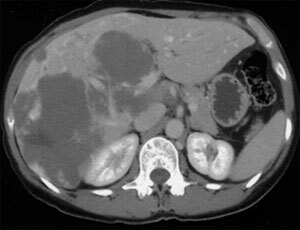 Cavernous hemangioma are atypical or irregular in arrangement and size. and separated by fibrous septa. Malignant transformation has not been reported. Surgical ligation of feeding vessels. reported to produce complete regression of hemangiomas.